You are invited to join a webinar: Amplifying Student Voice Through Global Connections. When: Tuesday, Feb 19th, 7:30pm USA Eastern time or check out your time and date from this link. Once registered, a link will be emailed to you to join the actual session in real time, followed by a link to the recording. About this session: Learning does not have to stay within the four walls of the classroom. Teachers can easily take learning beyond the classroom walls and amplify student voice. 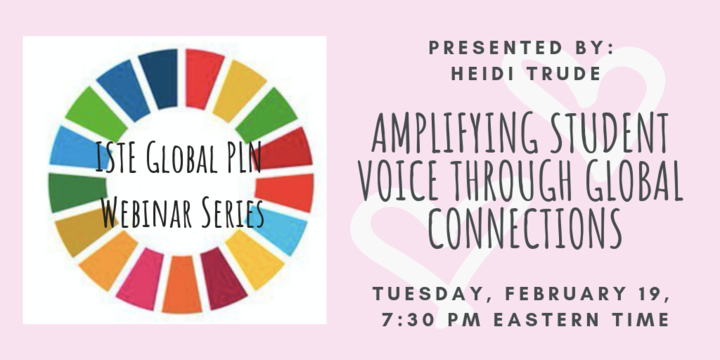 In this webinar, Heidi Trude will share how teachers can easily use tools like Flipgrid, Padlet, and G-Suite for Education to make global connections in their classrooms. She will explain how she uses each of these tools in her classroom and how her students are now connecting and collaborating with their partner school in France. Login: Once you register, the link to join the online webinar will be emailed to you.